Do you like those chocolate covered coconut “Mounds” or “Almond Joy” candy bars? If so, you are in for a healthy breakfast treat! A couple years ago, I couldn’t stand coconut but now, I love it in all forms. Coconut milk, coconut butter, flakes, flour, oil – it’s all delicious in my mind. 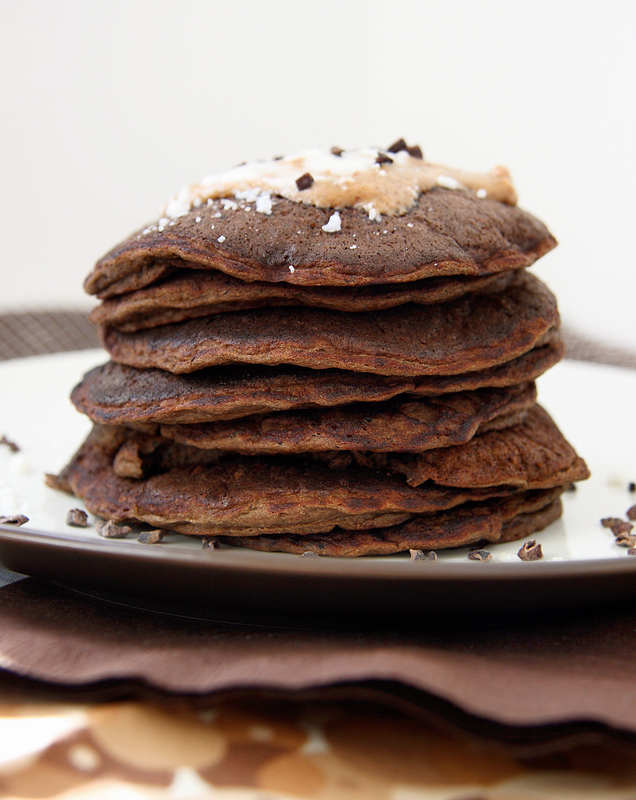 I used a combination of coconut ingredients and cacao powder for a Mounds-inspired pancakes. 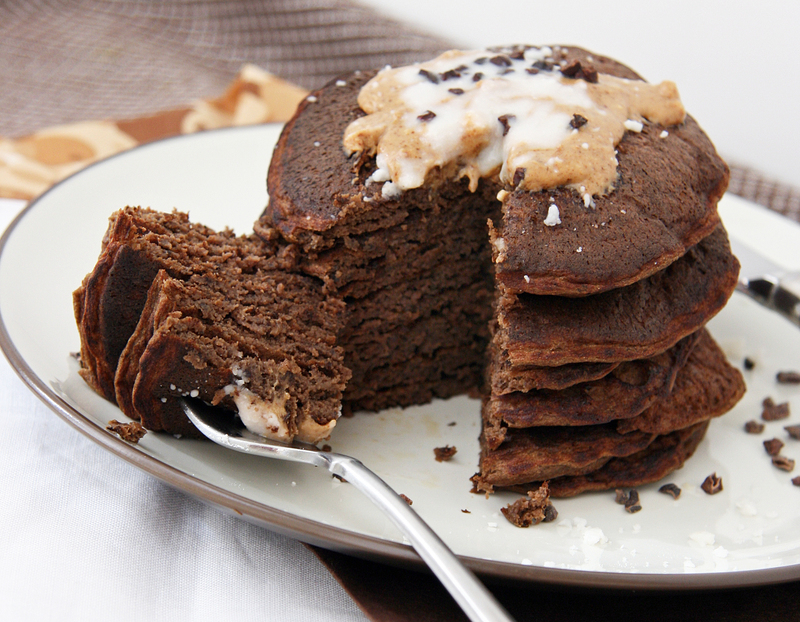 Topping these off with almond butter makes them more like Almond Joy pancakes, so either way you have a delicious, decadent AND healthy breakfast! 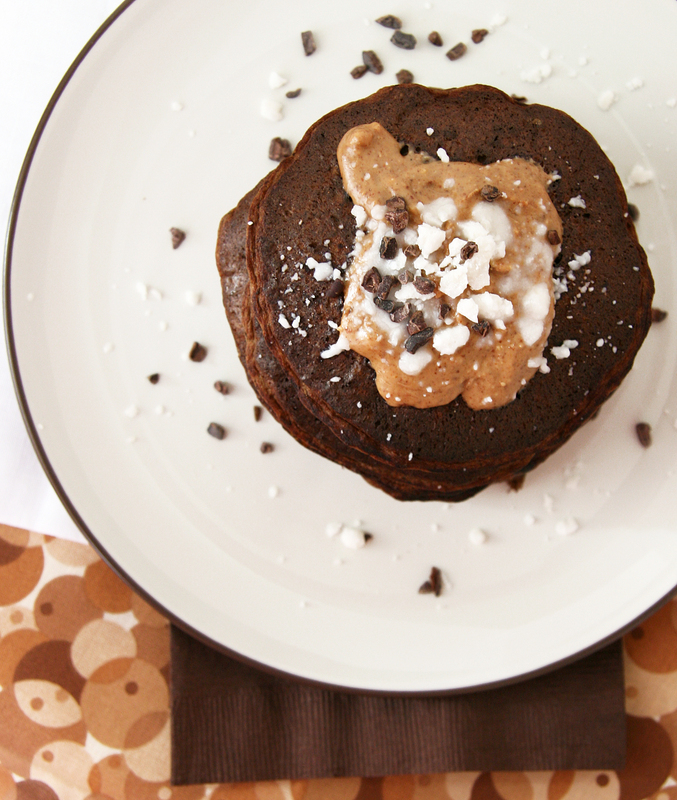 I adapted this recipe from my grain-free pumpkin pancakes that were a hit. Don’t be alarmed by the beans in these pancakes, you can’t taste them and they make the cakes really moist! 1. Preheat a griddle or large skillet over medium heat and grease with coconut oil (or butter/ghee but would not be dairy free). 2. Add all ingredients to a blender and mix until smooth. I liked these thick and fluffy but for thinner pancakes, add more milk. 3. Add several spoonfuls of batter to the pan and spread with the back of the spoon to 3-4 inches each, cooking three pancakes at a time. Cook until ready to flip (mine took about 2-3 minutes depending on thickness). Flip over until cooked through. 4. 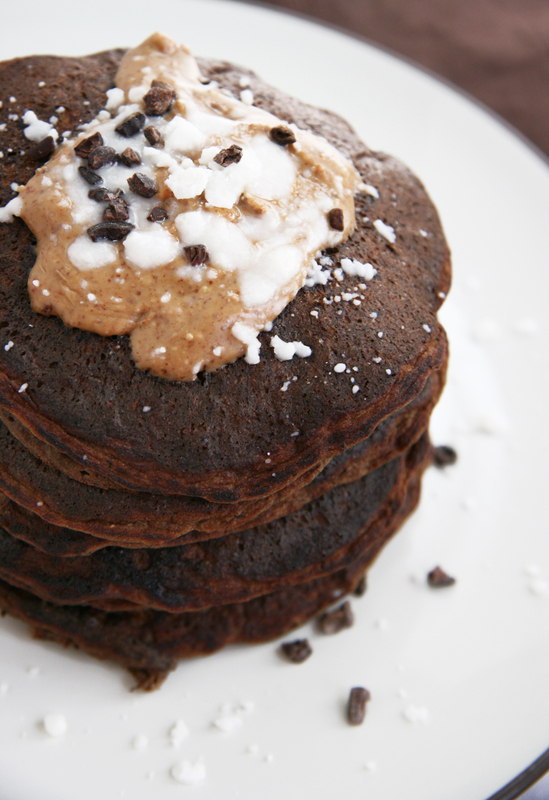 Top with coconut butter, cacao nibs and almond butter (or honey/agave/maple syrup) and serve! I am a huge fan of coconut, especially Mounds bars. I bet these are delicious 😀 Love the puddle of almond butter and coconut butter on top – yum! They look amazing! I saw the pictures and immediately went down to the ingredient list to see if I could make these for breakfast and as I went down the ingredient list I was so happy and then reached cooked black beans. Haha. I knew it was too good to be true! No delicious pancakes for me in the morning. No beans around here. I ate my first bean ever last week in the form of a deep dish cookie pie and I thought it was kind of revolting. Oh well. One day maybe I’ll grow to like them (and coconut!). I know I sure will give them a try! My, these babies look way too delicious to pass. And I just LOVE the fact that they call for black beans. I love things with beans! Awesome recipe, Nora. Can’t wait to try this one. Love that it’s completely grain free, too! I’ll be allowed to have them during Lent! (well, minus the honey, but I’m sure it’ll work…) Ooooooh, goodie! Hey, I just saw that it said chickpeas! Since I bought chickpeas today, maybe I’ll try that instead of beans. I have to get used to one “strange” thing in my goodies before I can move on to another. It has a strong taste? That stinks. I wanted to make something… special… with it. We’ll see if it works out! I’m guessing not if it has a strong taste! May I ask a question? First I got to say that I am very excited I found your site! You have a bunch of amazing recipes, but here comes my question – do I have to add the beans? I cannot eat beans because of my pancreas, so is it a big deal? I would love to make those pancakes. Hi Lenka! I am glad you found me too 🙂 You can make these pancakes without the beans but the consistency will be a bit different because the beans add moisture and fluffiness. Have you ever eaten almond flour or coconut flour pancakes? I’d be happy to send you some recipes I’ve made in the past! I eat the whole batch but I’m an eater 🙂 If you are looking for a smaller batch, you could cut the recipe in half? I hope you enjoy them as much as I did! I made these this morning. Great recipe! Chocolate and coconut is one of my favorite combos. These look delic! I made a batch of my own Almond Joy style ‘cakes a few weeks ago 🙂 I didn’t add beans or use coocnut flour, those sound like fun to try! Hi! I love these pancakes and have made them a couple of times. However, I am not able to flip them – it ends up falling apart and I have to just eat it as a crumble. Still tastes good but not in pancake form. I didn’t have any baking soda when I made them though, so that’s the only thing I left out – would that make a difference? Thanks!